The Echo Dot is a voice-controlled device with a small built-in speaker—it can also connect to the Philips Hue White Starter Kit to switch on the lamp before getting out of bed or dim the lights from the couch to watch a movie—all without lifting a finger. 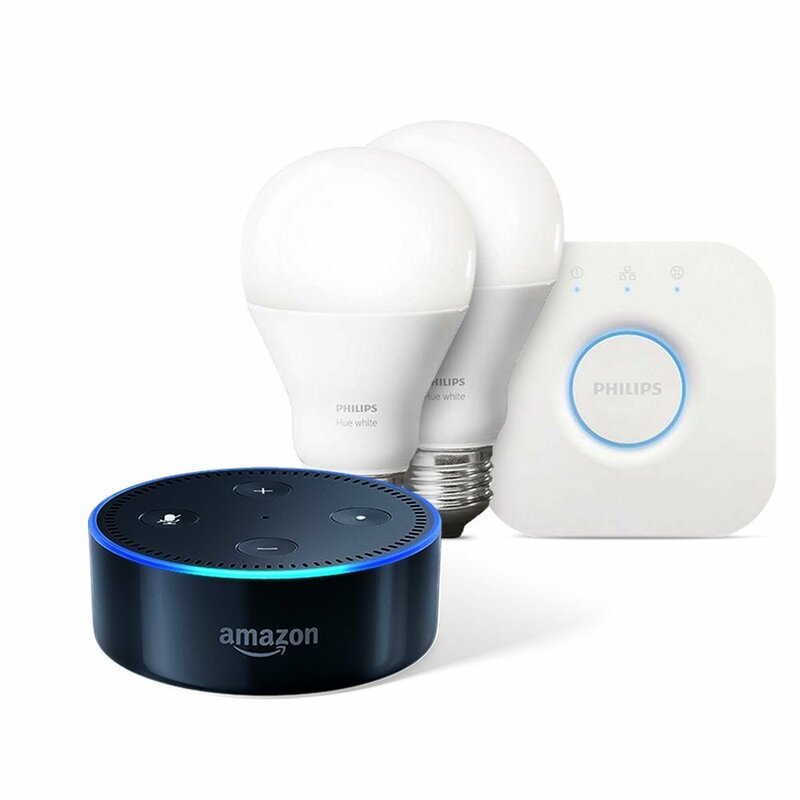 When pairing the Philips Hue White Starter Kit with the Echo Dot you get all the hands-free conveniences that Amazon Alexa provides such as making calls, sending and receiving messages, and providing news and other information. When adding the Philips Hue White Starter Kit you’ll be able to enhance your home with soft white lighting, controlled remotely wherever you are. Set timers and light schedules, automating your lights to make it seem like someone is home even when you are away. With everything you need to get started, this easy-to-use kit comes with two A19 LED smart bulbs, able to fit standard table lamps and the Philips Hue Bridge that can control up to 50 lights. Install the LED lights as you would install ordinary bulbs. They are pre-paired with the Hue Bridge, which allows you to control smart-bulb-equipped lamps and overhead lights via the Philips Hue App. Using voice control with Alexa through the Echo Dot each kit includes two dimmable soft White A19 bulbs, a Hue Bridge, ethernet cable, power adapter, manual, and three-year warranty. Alexa-enabled products work with devices such as lights, switches, thermostats, and more, that you can control using your voice. Ask Alexa to switch on a lamp, turn on the fan, dim the lights, or increase the temperature. Some products work directly with Alexa and other smart home ecosystems require a compatible hub. Below are the top brands that work with Alexa. The Samsung SmartThings Home Hub connects several devices to Alexa so you can control them with your voice. In addition, the SmartThings Hub can control a network of SmartThings products from a smartphone or tablet using a companion app. Honeywell products work directly with Alexa so you can control them with your voice—no hub required. In addition, Honeywell thermostats can be controlled from a smartphone or tablet using a companion app. The Wink Connected Home Hub connects several devices to Alexa so you can control them with your voice. In addition, the Wink Hub can control a network of Wink-enabled products from a smartphone or tablet using a companion app. The Insteon Central Controller Hub connects several devices to Alexa so you can control them with your voice. 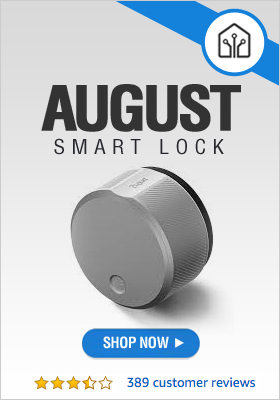 In addition, the Insteon Hub can control a network of Insteon products, such as light bulbs, ceiling fans, and thermostats, from a smartphone or tablet using a companion app. WeMo products work directly with Alexa so you can control them with your voice—no hub required. 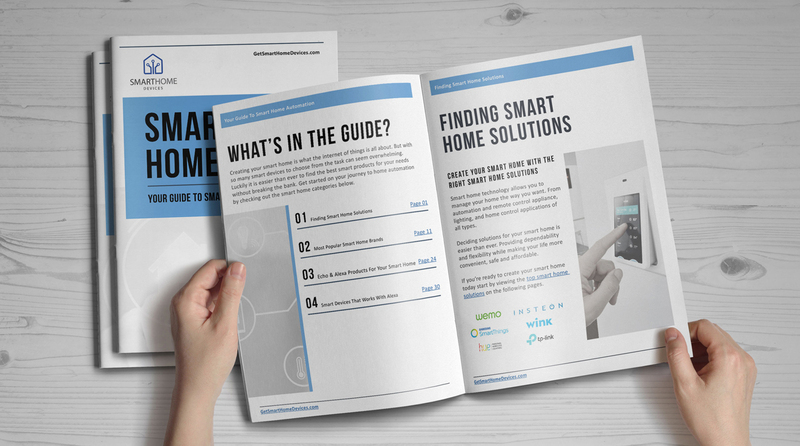 In addition, WeMo switches and outlets can be controlled from a smartphone or tablet using a companion app. Caseta Wireless by Lutron uses a Caseta Wireless Smart Bridge to connect to Alexa so you can control dimmers and switches with your voice. Echo and other Alexa devices let you instantly connect to Alexa to play music, control your smart home, get information, news, weather, and more using just your voice. Far-field voice control lets Alexa hear you from across the room even when music is playing. All you have to do is ask.